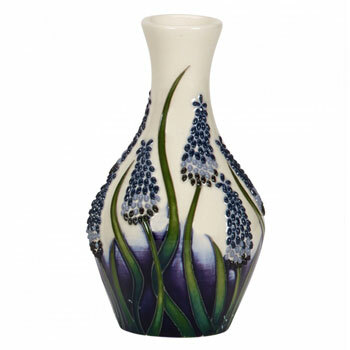 Moorcroft Muscari 372-5 Discounts Apply ! This piece from the Flying Phoenix Collection depicting The Blue Muscari Flower that Carpeted the floor of the forrest areas on this super Ginger Jar. Elise was inspired by the Journey through the Cevennes National Park in the South Of France, with the Flora and Fauna .